What does this left part of the Activity App mean? Discussion in 'Apple Watch' started by The Doctor11, May 3, 2015. Does anyone know what this means? I have been trying to figure it out since getting my watch on the 24th. Still no idea. Can anyone help me out? Also if you don't know you can see it by swiping left on the calender view. I it pulls up to two weeks history from your iPhone. It's your calorie goal for that week. This. And it shows how much you have improved (or not) over the last week (see the -5%). Thank you guys for your help. I find it very odd is not the average. It looks to me like it's only talking about Sunday. Unless that is just because today is Sunday and tomorrow it will only show Monday. Either way they should change it to be the average goal. Step by step how do I go about seeing this screen? Do you not stand at all?! ...or exercise at all (even a brisk walk or limited exertion would give you some credit)? When you pull to the left to see that side bar those disappear. Don't worry I stand and exercise! I don't want to complicate things but I also am blind. Might make seeing this difficult. Lost a leg last year, thinking of changing my name to Ilean... So no we have that out of the way.........#. Figured it out thanks for the help though. Nothing like a good dose of sarcasm to fuel some rigorous google searching. I don't want to complicate things but I also am blind. Might make seeing this difficult. Lost a leg last year, thinking of changing my name to Ilean... So no we have that out of the way.........&#55357;&#56860;. Figured it out thanks for the help though. Nothing like a good dose of sarcasm to fuel some rigorous google searching. Interesting! I didn't realize you could swipe from the left to bring that up. I think the reason it's the goal is that it gives context to that weeks move rings. Otherwise, you could have a goal of 500 one week and see a week of full rings. Maybe next week you were feeling crazy and set your goal to 1500, and now your move rings maybe are only filling halfway. 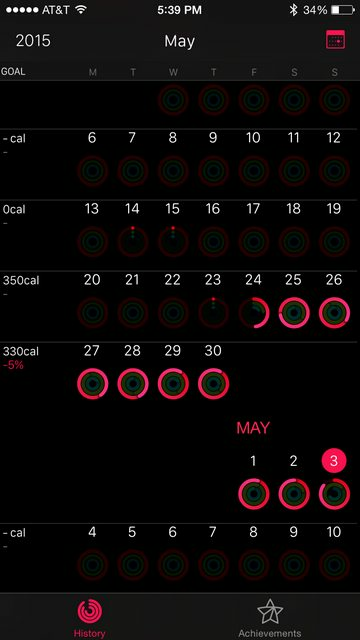 When you look back on your history, if you're wondering why you didn't fill your rings that week, you can swipe from the left to see the goal you had set and remind yourself that halfway on the move rings that week still means ~750!